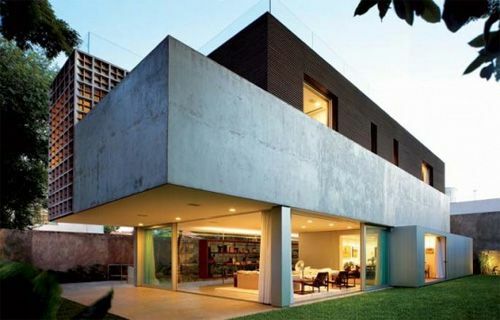 Two large perpendiculars volumes make up the Planalto House, an imposing modern residential project designed by architect in São Paulo, Brazil. The street facade reveals the garage and a slightly cantilevered second floor continued with a terrace to the left. But as you move around the building, its complexity grows exponentially. Planalto house was envisioned as an urban living space for a couple with two children and has a total surface of 800 square meters. Here is more on the structure of the residence from the architects: “A rectangular prism, perpendicular to the street, contains the intimate features of the house on the upper floor, occupying only half of the land and releasing the other half for recreation and landscaping. Serving as a support and focused only on the main floor, another rectangular prism, but in different proportions, contains the service and social functions of the house”. It is interesting to observe how transparency blends with opacity, due to the materials employed in various functional zones. Enjoy discovering the project in detail and let us know what you think!